We all hate having to shovel our driveways, but it’s even worse when you’ve got an entire parking lot and entrance to keep safe for staff and customers. Without proper care of your commercial land, a business can be stopped, employees won’t be able to get in, and it is all around dangerous. When the snow hits, you need a plan in place to take care of it, that is why you should hire a snow removal company to do it for you. When your parking lots are clear, this makes a safer environment for yourself and anyone coming and going to your office. 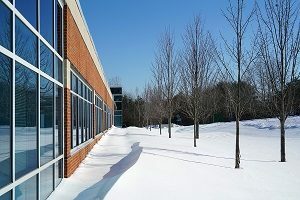 If you don’t have the proper snow removal plan in place for your business, your company could suffer. Clients and employees will struggle to park and will be hesitant to come in if it is not safe enough. Without the proper snow removal plan, there could be ice buildup that will lead to slips and falls which will be dangerous for anyone coming in and out of the office. Did you know that not only does snow removal apply to areas you drive on, but also your roofs? Make sure that after a heavy snowfall you get out to your businesses roof and remove the snow. If you cannot do this yourself, because the office is too large, give a professional a call. Leaving snow on your roof can be dangerous, especially if the building is older. Keep your roofs strong, and in place, by having someone take off the snow for you. In any event that the winter brings us, there is always a potential for slips and falls. If you do not take the proper precautions, then there could be a lawsuit on your hands. This includes shoveling parking lots and walkways. You should also keep in mind that you may need to have some deicers in your building in case some spots are more slippery than others. Be sure you have a good handle on what you need this winter, and what your snow removal plan consists of. Private driveways the city doesn’t plow, if your business is set back a bit and you have a driveway to get into your parking lot, a snow removal company can clear that for you. Walkways are usually smaller areas, but snow removal companies can come in and clear those for you too, so you do not have to worry about it. Customer and staff access or entrance and exits that must be cleared for guests to arrive safely into your building. Do you have a snow removal plan in place for this winter? Need a quote for a snow removal company? Contact us at Greener Horizon. We provide full Snow & Ice Management services, including commercial snow removal in southeastern Massachusetts.